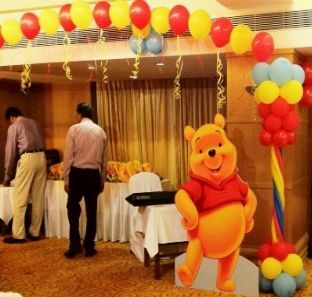 One of the favorite cartoon characters of today and tomorrow, is the tender bear Winnie the Pooh, he and all his friends are definitely one of the favorite subjects for the decoration of children parties. 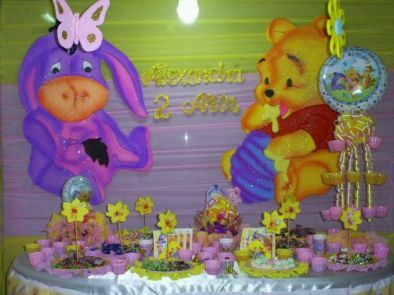 If you decide to make the birthday of your boy or girl, this animated series gives you a lot of possibilities to decorate the rooms of this important event, because one thing is certain, the only thing you want is to give the best and that includes desire, the big birthday party. Here are some decorating ideas that may be useful. 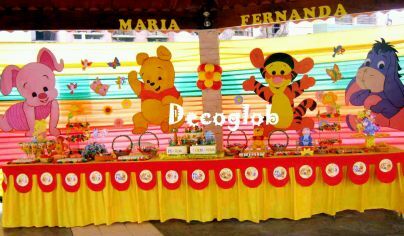 In this first proposal have a printed panel on the back and front of balloons frame adorned with flowers and butterflies, as if they were in the jungle, in the front again the presence of the characters but made of wood, cloth the table is a good complement as barrel resembles the Pooh with honey bees included. 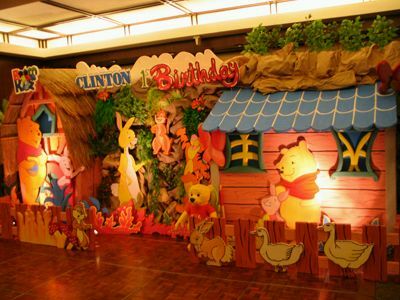 Beautiful and quite original proposal that recreates some houses and part of the field, with a number of characters in them, all this is made of wood. The arches of balloons never fail, but what better if you accompany a large Pooh welcoming the guests. 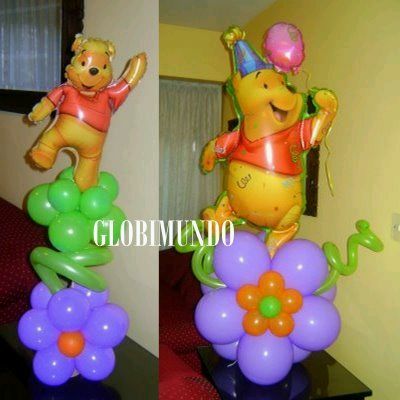 It also has the option, decorate with balloons and figures made of metallic balloons with the character of the beloved bear. If you have an open, maybe they're multicolored fabric cloths, and even, as the picture shows, you can decorate the rooms with the characters of the series but babies. 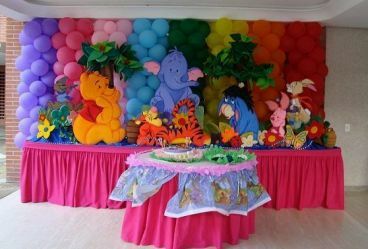 If you prefer balloons, columns multicolored backdrop and the table decorated with characters, ahead, is the favorite decoration. 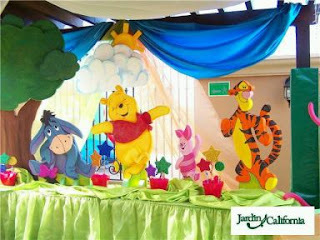 Original proposal using a wooden bow hanging fabrics and embellishments to recreate nature in the table are the characters of the animated series. 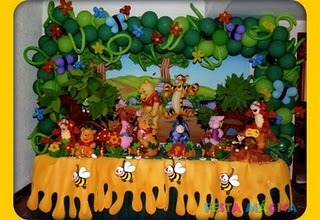 If you plan to use only some of the characters in the series, is also a good idea in the following picture has Pooh and the donkey. 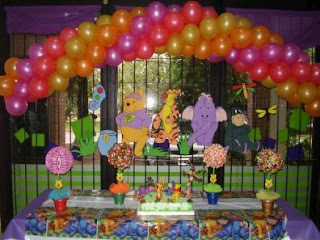 Finally, you just need a little imagination to make your celebration perfect, as shown in the following image, just a balloon arch and characters glued to the screen, so that the environment will be very well decorated.